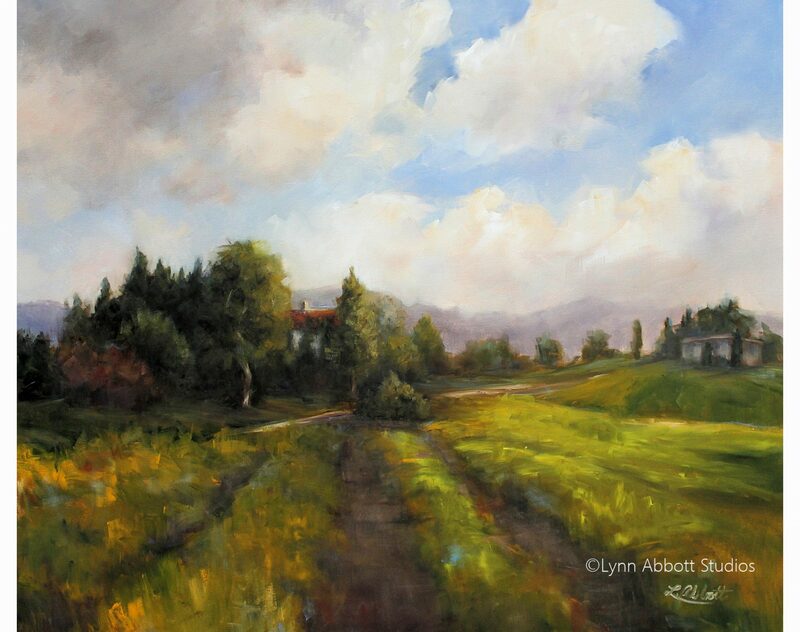 “The Clearing,” © Lynn Abbott Studios. Used with Permission. To most people, the painting appeared successful. But as its creator, I knew what lurked beneath the surface. The composition had radically departed from my vision for it. 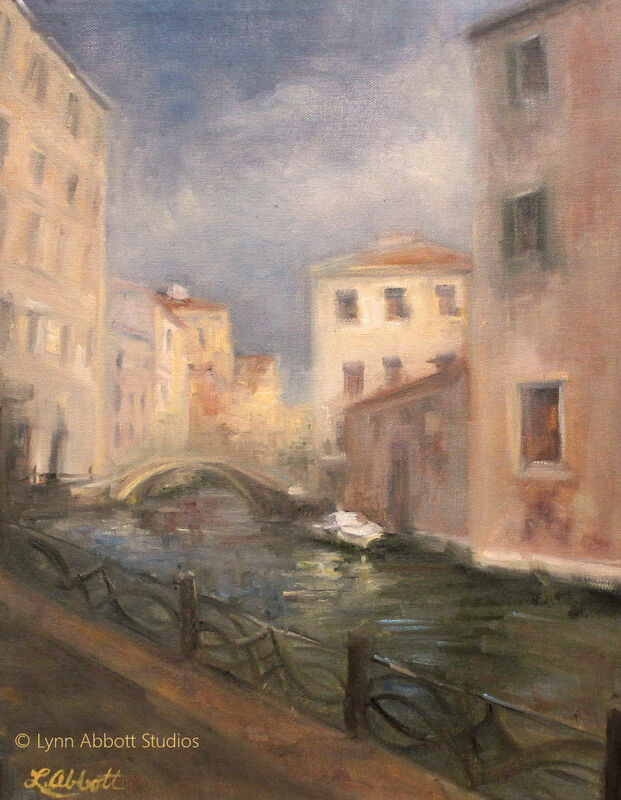 Portions of the painting exhibited the wrong values…in art speak, values refer to the dark or light tones of a piece. Sometimes, for one reason or another, a canvas and particular brand of paint don’t play well together. In this case, one area of the canvas had “seized” the paint. That part of the composition had definitely assumed an overly dark tone. Then, there had been the cover-up. An unsuccessful one at that. Yup. You see, buried under globs of gooey oil paint, the darkness remained. That part of the painting had defied my vision, my purpose and plan for its greatness, beauty and glory. I also recognized the remedy for its rebellion. So I picked up a rag that had been soaked in Turpenoid, and wiped the offending area clean. The composition had gone rogue. It couldn’t be helped. The wrong values would never succeed. The foundation must be corrected. And no amount of overlaid paint would fix it. Had I not cleaned that area of canvas, I ultimately would have found it necessary to remove the entire painting from public view and use. After all, it did not accurately reflect its Creator and it certainly didn’t measure up to its potential. Thus, I worked to clean the canvas; to wipe away every trace of the offending and poorly placed value; to restore the composition’s original potential and beauty. That’s right. At times, life imitates art. 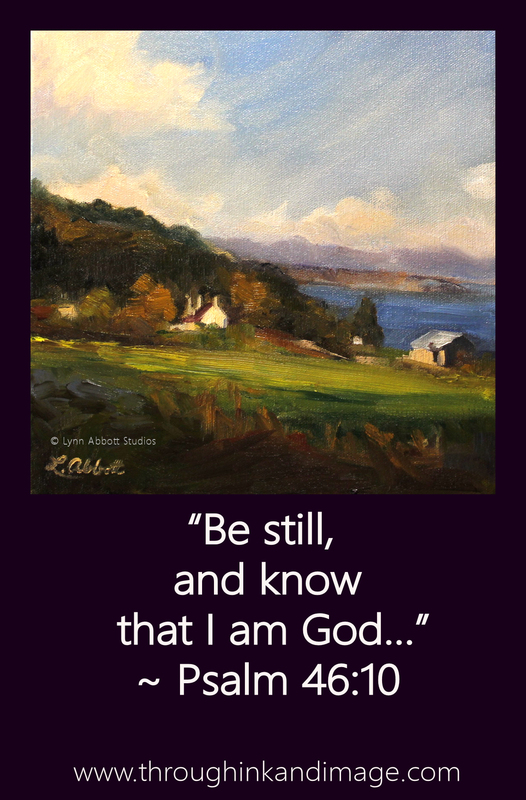 As I reworked the canvas, my thoughts wandered to my recent readings in Samuel and Kings. And you betcha… David immediately came to mind. David, God’s beloved composition, moved in the wrong direction. He not only made a poor choice, he rebelled against his Creator. 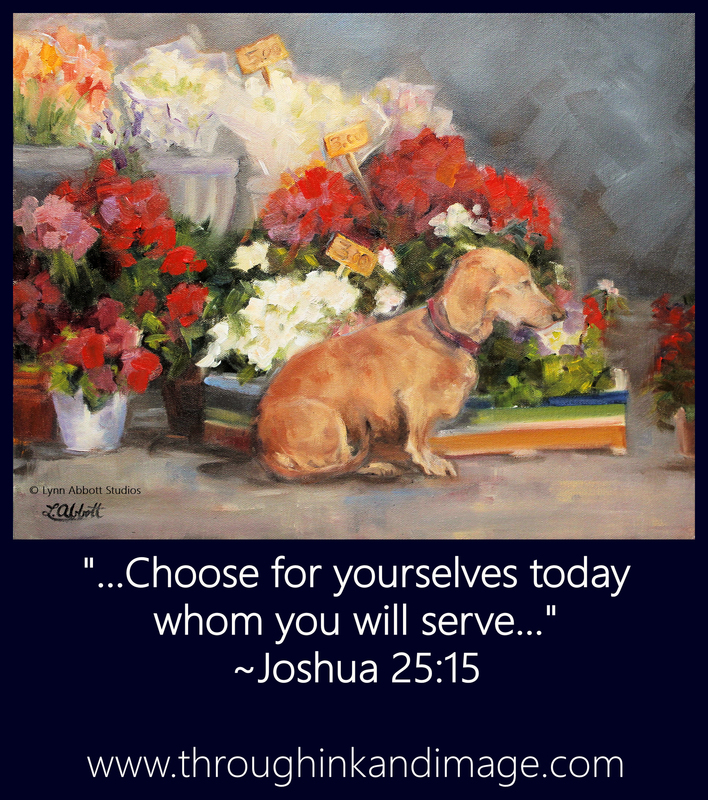 In 2 Samuel 11, David embraced dark values when he not only slept with Bathsheba, the wife of one in his inner circle, but also arranged to have his faithful friend conveniently assassinated in order to cover up the deed. God, however, sees past cover-ups. He always has and always will. Who can forget His pointed questions to the first couple in the garden, “Where are you?” and later, “Who told you were naked? Have you eaten from the tree that I commanded you not to eat from?” (Genesis 3:9, 11). Indeed, sin makes us vulnerable. But apart from the Creator, the canvas is helpless to correct the situation. Thus, we attempt a cover-up. Humanity’s modus operandi has changed little since the garden. At times, life imitates art. But while heavy paint might successfully hide darkness from the majority, the Creator always knows what’s beneath the surface. For this reason, God sent Nathan the prophet to do a little clean up and to expedite David’s restoration. Most are familiar with David’s story. But what especially impresses me is David’s honest and humble response to Nathan’s correction. After all, David’s predecessor had disobeyed God as well, but his response to Samuel’s rebuke contrasts greatly with David’s. Like Adam and Eve, Saul made excuses for his disobedience; he even blamed his people. David, on the other hand, said, “I have sinned against the LORD,” (2 Samuel 12:13). The plain and simple truth is…David genuinely repented. I dunno about you, but I find tremendous comfort in David’s outcome. Although natural and negative consequences followed despite David’s “broken and contrite” spirit, God nevertheless declared David forgiven, (2 Samuel 12:13b). In addition, David remained on the throne. He was still God’s man. Eager to know more about David’s life after sin, I skipped ahead a few books to the book of Psalms. And there, I found the expression of David’s grief and repentence. “Have mercy on me, O God, according to your unfailing love…Wash away all my iniquity and cleanse me from my sin…Cleanse me with hyssop, and I will be clean; wash me and I will be whiter than snow,” (Psalm 51:1-2; 7). Then, in Psalm 103, David recounts God’s forgiveness: “Praise the LORD, O my soul…He does not treat us as our sins deserve…For as high as the heavens are above the earth, so great is His love for those who fear Him; as far as the east is from the west, so far has He removed our transgressions from us,” (Psalm 103:1; 10-12). As far as the east is from the west… That’s certainly an interesting comparison. It’s significant that he didn’t say “as far as north is from south.” North and South on this ole’ globe have definite points of destination–the North and South poles. But east and west? The longitude line that separates them is simply an agreed-upon– albeit arbitrary choice–made by cartographers and geographers. In truth, we could circle the globe continuously and not find a distinct point differentiating east from west. David’s description, then, perfectly illustrates God’s love and grace as demonstrated toward His beloved children. As John wrote in his epistle, once we have “confessed our sin, He is faithful and just to forgive us our sin and to cleanse us from all unrighteousness,” (1 John 1:9). The Creator permanently wipes rebellion’s stain from the canvas; the composition is once more “blameless” or in right standing. David understood his Sovereign-Shepherd’s love forgiveness first-hand. And he trusted God for the long-haul. Without a doubt, God’s perfect love “casts out fear,” ( 1 John 4:18). In fact, although David’s sin resulted in some extremely difficult family dynamics, he humbly accepted his circumstances and placed his life in God’s hands (2 Samuel 15). Saul, on the other hand, continually tried to dodge the consequences of his sin. In his unrepentant state, Saul even consulted a medium, the Witch of Endor. Without a doubt, fear characterized Saul’s life from the moment he refused to humbly confess his sin. David, however, trusted God. And despite his sin, David’s life and reign became the Scriptural standard by which all other kings of Israel and Judah were judged. In this, I find incredible hope. Although my life’s canvas may be darkened by sin, God stands ready with the remedy. And in response to my genuine confession, He removes the dark values that threaten the beauty of His ongoing work in my life. Yes, He removes our sin as far as the east is from the west. And you and I can be sure that He will restore and transform the composition of our lives. Amen and amen! You are so right, Kathy! I have nothing further to add to your wise assessment… except perhaps to agree with you and say, “How great is our God!” Love and hugs to you, my dear friend! That is absolutely beautiful! What a wonderful picture of God’s grace to us, of our need to repent of our sins, and of how God restores us to his original design for us. Love it! So encouraging, too. Thank you with all my heart, Sue! Your music/songs continually encourage me, and so I am delighted if anything I can offer here can encourage you in return. Hugs! I love your paintings and your writings. You are very gifted of God, and such an inspiration and encouragement to me, too! Hugs back!! Aww… thank you, dear Sue! ❤ and hugs to you, my lovely friend! Absolutely love this post, Lynn. It speaks directly on the condition of humanity’s sinful and God as the artist; who is willing to remove the dark areas of our lives if we just confess our sins to Him. Life is like a work of art and God is always standing there; ready for us to get down on our knees and confess our sins so that He can use the “remedy” to remove the sinful stains. Oh, I’m so glad, Joshua! Your encouragement truly means a lot to me as I so respect your indepth studies of Scripture. I especially love the thoughts that you express here: “Life is like a work of art and God is always standing there; ready for us to get down on our knees and confess our sins so that He can use the “remedy” to remove the sinful stains.” Thank you for your wise words! Nonetheless, I love the softness of your strokes that blend so well with the colors of that picture. Thank you for your post. Thank you so very much, T.F. I used my “Turpenoid soaked rag” quite a bit with this painting 😉 God bless you greatly for your kind encouragement! I was much like you when folks would oooh and ah​hh over something I’d painted. Yet I knew it was all wrong from the get go—I wouldn’t be happy with it despite those untrained eyes who liked it—-it simply wasn’t right, and I knew it—so much like my life. I come to God, ​and I know what I’m hiding, covering up or trying to pass off as acceptable—but He knows..​​..
A marvelous lesson this Monday morning Lynn—thank you! I knew I could count on you–my kindred blogging spirit–dear Julie to fully understand this post! And like you, I’m truly grateful that the Father not only knows me through and through, but that He has a better plan for me than I could ever imagine! Thank you, my wonderful and caring friend, for your faithful and kind encouragement! You and your friendship are such a blessing to me! Love and hugs! Yes and amen! Oh, you are truly my soul sister, dear Julie! So, “been there; done that!” I’ve got to find a way to tag along with Tim next time he flies to corporate headquarters in Atlanta! You and I probably have enough conversation to last for days on end 😉 ❤ and hugs! I love the comparison of using east and west instead of north and south, especially since Isaiah knew nothing of the north and south poles. Only God could come up with that. Psalm 51 – the great psalm of David’s remorse. I turn too this whenever II have done something I regret. We serve such a merciful God. Quite frankly, Pete, I’m especially thankful that ONLY the Creator can see what is underneath. What a comforting thought since Abba knows and loves me in spite of myself 🙂 Thank you for your encouraging words, Pete! You and your blog are truly a blessing! Same to you, Pete! God bless you big time! Awesome post Lynn, as usual. I especially love this line. “God, however, sees past cover-ups. He always has and always will.” And thank God he does or we would never become the vessels he wants us to become! Beautiful post and painting!! Thank you with all my heart, Vincent! I so appreciate your kindness and I love how you catalog not only your own teaching but the teachings of so many! Your blog is a blessing to all those who love God! 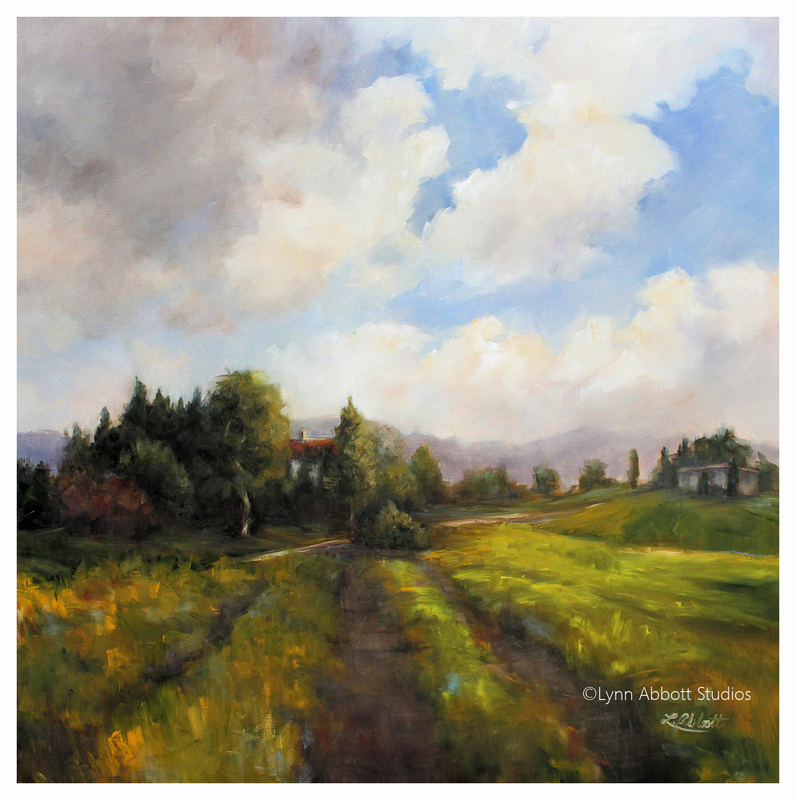 Hi Lynn, Did you paint the paintings featured in your posts? They are very good. Great idea to pair the two. Love the paintings. Thanks for sharing. Thank you so much! I’m so glad to have met you here! “And you and I can be sure that He will restore and transform the composition of our lives.” Thank you, Lynn, for these encouraging words. This post reminds us that He’s not finished with us just yet. FYI – my younger son is an artist and has amazed us from his early childhood days with his eye for detail. He, like you, is also open to God’s leading and so appreciative of God’s beauty. Thank you for sharing your gifts with us. Amen! I’m so grateful that God is still at work in my life. Thank you so much for your thoughtful words and kind encouragement, Dorissa. It means a great deal to me. And oh, I would love to see your son’s work! Does he have a website? It is always so encouraging to meet other artists who follow Jesus. God bless you greatly! Lynn, one of his sites is http://www.warpaintgraphix.com. It is one of his businesses. He designs logos for clothing and logos, business cards and websites for businesses, among other things that I can’t remember… He designed the cover for my book and you can see it if you will go to my site and check out the “book” heading. I don’t know how to get photos of some of the artwork he’s done for me onto my WordPress site, but I’ll try to figure it out or get him to help me. I would love for you to see the paintings of moms and babies he’s created. I feel so blessed to have his artwork displayed in our home! My husband and my older son are both very creative, too, and all three have a gift for music, as well. So, I am blessed to get to enjoy their creativity … and I can make really great brownies from a box, so there!!! Yes! Exactly, Maggie! And thank you so much for your encouragement re: the post. Sometimes, I’m so busy that I don’t have time to stand back and look at a blog post’s “big picture.” It means so much, then, when a friend I love and respect likes the post! I so appreciate your thoughtful response. It truly means the world to me! ❤ and hugs! Maggie: Your response is just perfect!!!!! Yes! Maggie is wonderful, isn’t she? She totally gets the theme of my blog…And obviously you do as well! I’m so grateful. Being fully understood is so wonderful. You both are kindred spirits! Love and huge hugs! I love the analogy. I keep trying to put paint upon paint to my mistakes when I really just need to wipe them clean. Yes, exactly! I think this is the story of all our lives. 🙂 God bless you, my talented friend! I love how you painted a picture (literally as well) of how we oftentimes hide our mistakes under the surface. As you pointed out, it is so refreshing to know God forgives even David’s indiscretions. It is proof His love is unchanging! Amen! And I am so thankful for God’s unchanging love and grace! Thank you for your beautiful insight, Lacy! Hugs! Beautiful post, beautiful summation. I’m following King David’s lead right now with an area that I have neglected and trusting God will truly fix the problem and wipe aside my neglect and partial patch job. You’re such a gift to us Lynn, thank you for the words you use that paint a picture of God’s love, grace and forgiveness. Grace and blessings! And that is yet another reason why all your readers love and respect you, Bruce! You truly have a heart for God and seek to follow His leading in everything you do. I’m so blessed by your teaching and example. Thank you again for your kind encouragement here. Your wisdom and kindness always mean so much to me. Blessings to you and yours, Bruce! I always enjoy how you combine life with scripture. It’s beautifully woven together. How precious is our God who can wipe away out darkness and start us off clean. We can treat each new day like this if we give ourselves to Him. Oh, thank you, dear T.R. And amen and amen! So grateful that His “mercies are new every morning.” Love and hugs! This is lovely, Lynn! What a fantastic analogy with the painting! It’s funny to me that I have recently been studying Psalm 51 and the tale of David and Bathsheba, too! Last week, I wrote my own thoughts at the beginning of my study. Lol!! I remmeber now. Sorry – it’s been a crazy week here, too, but now that you mention it, I remember our conversation. I actually had such a beautiful opportunity this morning to tell the story of the Psalm to one of my neighbor girls. Thank you so much for your encouragement! You are too kind! I make more mistakes than I do things right. Just thankful God even uses my mess! I feel the same way about my life, Heather! So thankful for God’s grace. Huge hugs! Oh, Lynn. I LOVE all the deep lessons in this post. I never knew a painting’s composition can go “rogue” and the artist has to wipe it clean rather than paint over it. Such an interesting analogy of how our Creator wipes us clean and gets rid of all the dark spots of our sin. The idea of Him removing them as far as “east from west” adds a deeper meaning. I am always amazed at God calling David a man after His own heart. It’s such an awesome wonder that God cleans us so thoroughly and even forgets our sins. Thank you SO MUCH for these encouraging and inspiring lessons today! Love and hugs to you! Thank you. Excellent explanation. Some people take David’s sins and used them to castigate Christians. They miss the fact we all sin. We all need forgiveness. Amen! So true, Tom! And thank you with all my heart for your encouragement! It means a lot to me! God bless you greatly! And like many, I have read PSALM 51 so much because it is the sinner’s prayer. So thanks for pointing it out in a new way to me. Your words were a blessing. Aww… thank you for your lovely and encouraging words! It means so much to me. And yes, it is so comforting to know that God answers our hearts’ cries and does renew that right spirit within us! I love that verse 10 is your life verse! What a beautiful prayer to express the desire of your heart and life! God bless you big time as you have so blessed me today! What a wonderful illustration of God’s redeeming work—He doesn’t cover our sins, but He removes them clean away. Isn’t it wonderful? Thank you for your encouraging comment, Linda! Hugs! I really appreciate your Analogies that you share with us Lynn, Debbie another Blogging friend does the same and you both share much Wisdom when you do this. Yes God knew David would repent and no longer choose to Sin and it was not just with Bathsheba that he did Sin. Although God said they were not to intermarry with Pagans, David disobeyed and Married Pagan Woman after not forgiving his wife for laughing at him and also seeking revenge by not having Children with her. I also agree with you Lynn about covering up Sin, Love is the most powerful force in the Universe by it we and everything else were created, God is Love! and He said everything He made was very good but the black spots came with the Fall. Yes as you shared Lynn if we Sin we can be forgiven as we put our Carnal flesh to death and Aim to be Perfected in Love. Jesus is our Advocate and will intercede for us after Heart repentance, which is shown by our turning away from Sin and Choosing to do good by the empowering of The Holy Spirit. I had a white dress Lynn with black stains on it so I used a white out marking pen to cover them up and it worked but a few washes later they were back so I did them again but once again they reappeared so I brought a new white dress and yes it has no black spots at all. We can be like the dress with the black spots, we can try to cover up out Sinful nature, negative and Sinful thoughts and attitudes and try to hide them, minimize them or ignore them but they will return. We have to be clothed in a new Spotless garment which Jesus brought for us by His death but we can’t wear both, one has to go, this is why God tells us to put our evil flesh Nature to death and as we choose to walk in The Fruit of The Spirit ( Galations5 ) He empowers us to do so and so our flesh is put to death and what is so wonderful is our New Spiritual garments is without Spot or Wrinkle it’s all White, meaning Pure and Holy… the Old has gone and the New has come. Jesus has set us free from the Slavery of Sin so no Temptation will be greater then we can bear, He provides His Strength to resist it and so Walk as He Walked in Holiness and Victory. God tells us to reckon ourselves dead to Sin Lynn and not say we will continue to Sin (Romans 6:11) and for us to Aim for Perfection but not as the World thinks about perfection but His Perfection in Love (see below) and He delights in us when we do because we are no longer in darkness, we Shine, Shine, Shine, yes we are like Jesus in this World. Oh, thank you for your thoughtful encouragement, dear Anne! And I love the analogy you share! It’s perfect! How wonderful it is that you and I and all those who have received Christ as Savior and Lord will one day be given new garments… White and pure… We will not only stand righteous in Christ, but our old nature will finally be gone! What a beautiful day that will be! God bless you greatly, dear Anne! ❤ and hugs!! Lynn have you read God’s Plan of Salvation as confirmed in Scripture ? if not would you like to? it was taught in the early Church and is very important for us today but sadly is not shared by many, even in the Churches. I found another one of your Posts Lynn, I will respond tomorrow, it’s bed time in Aussie Land but you must be tired too with having to stand up all this time answering my Comments but never mind one day you will also be 108 and all your other Blogging friends will have to stand up too Lol. Christian Love and Blessing dear Lynn, have a good day and yes you can sit down now I’m off to bed. Are you speaking of a book or booklet, Anne? I love God’s plan for our salvation… it is woven throughout Scripture beginning in Genesis. Sadly, our world has gotten so busy that many people don’t seem to make time for as much deep study as they did once. I pray that God awakens all our hearts to His Word!